Black Narcissus was a film that was based off the book written by Rumer Godden in 1939. The film came out in 1947 in Technicolour and it is considered a psychological drama with significant sexual tension. The story follows a group of nuns who are sent away to a small village in the Himalayas where the freeing nature of the area and its people bring about an introduction to a sense of sexual freedom that the nuns have yet to experience. 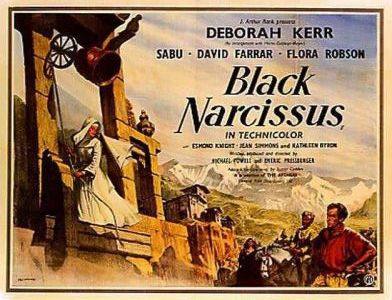 Clodaugh is one of the main nuns who is the Sister Superior and Sister Ruth is one of the nuns under her who becomes mentally unstable as she becomes jealous of Clodaugh who has gained an interest in the local English agent called Mr Dean. 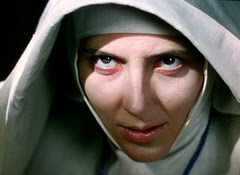 Towards the end of the film this jealousy causes Sister Ruth to have a violent response to the other nuns “her final appearance in the film, gaunt and wraithlike, is still one of the scariest moments in British cinema history” (Bradshaw,2005) she is shown to be disturbed and angry as she expressed her lust for Mr Dean and this can be seen in figure 2. 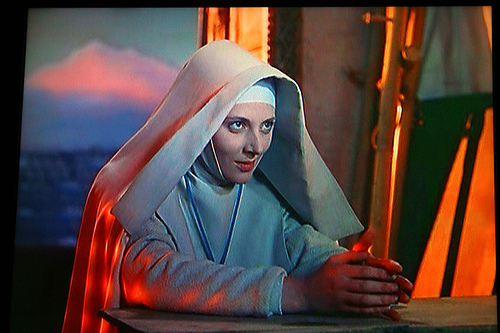 During the scenes of Sister Ruth’s transformation into violent jealousy, there is a prominent use of the colour red which shows her sexual desire and also her increasing violent anger towards Clodaugh, “a slash of red lipstick clashes with the bleached white of a nun’s habit to say so much about repressed desires” (Thomas, 2005) The use of technicolour throughout the film helps to establish the differences between culture and people’s thoughts and feelings, “He depicts the nuns' mountain enclave as an ashen and distant; colourless as the sisterhood's singular devotion to their vocation. The local Indian populace is backdropped with vibrant colour, looking more natural and lively.” (Ebert,2010) The colours in the film allow the viewer to distinguish between the changes in attitude and emotion of the characters and this can be seen in figure 3 when Sister Ruth is becoming deranged. Both reviews have an excellent discussion around the use of colour and tone to suggest atmosphere and mood to the viewer - well done.